Security cameras are an essential investment in protecting your business, place of work, or personal property. If you are considering a new system or upgrading an old one, our comprehensive security camera system buying guide can show you what’s out there and where to start. High definition cameras deliver the video resolution you need to make out fine details like license plates and faces in your surveillance footage. HD cameras offer at least 3-5 times better clarity than the standard analog cameras. With modern technology, HD cameras and recorders are even cost comparative with traditional analog models. 1 megapixel (MP) resolution and above is considered high definition and is 720p. 2MP resolution is equivalent to full HD 1080P. An 8MP camera produces up to 4K ultra HD video. The higher the megapixel count of the camera, the sharper the image. The best thing about HD cameras is that you can digitally zoom while keeping the quality largely intact, rather than looking a bit blurry or pixelated. Continue through our security camera buying guide to see all of our HD options. There are 3 primary types of systems. Each operates over a separate type of cable and supports different types of camera technologies. See our dedicated page on choosing the right system for more details. Traditional Analog CCTV Systems operate over combo RG59 / siamese cable. They are the most cost-effective type, but have a limited zoom resolution. HD-CVI Systems operate over coaxial combo cable with BNC connections. Also called HD over coax, they are considered the industry standard for modern HD surveillance. Network IP Systems operate over standard CAT5/6 Ethernet cable. They are the newest system type and are capable of supporting video with 4K resolution (above 1080p). IP systems are easy to set up with power over Ethernet (PoE) capabilities. A DVR or NVR is the brains of a security system. This is where footage is recorded and stored. When buying a security camera system, follow the selection guide to ensure your recorder is compatible with the type of cameras you purchase. All recorders by CCTV Security Pros can be remotely accessed through your computer, smartphone or tablet. There, you can view live and recorded footage, as well as control your camera. You’re free to set your cameras to record 24/7, on a schedule, or by recorded motion. You can do this from anywhere, at any time, and at no monthly cost. Digital Video Recorders (DVR) are compatible with analog & HD-CVI cameras. Network Video Recorders (NVR) are compatible with network IP cameras. Each camera style has different benefits and capabilities. Just about all cameras we offer feature infrared night vision and can be used indoors and outdoors. You can even mix and match cameras of different types on the same surveillance network, as long as they are all compatible with the recorder. Our on-staff security experts can help guide you in buying the best security cameras for a custom-grade system. The size of the camera lens determines the viewing angle. You get more coverage out of every individual camera by selecting a wider angle lens, but objects of focus will appear further away. Find a more comprehensive guide to buying security cameras based on lens size on our lens comparison page. A 3.6mm lens is standard and produces a 90-degree field of view. 2.8mm is our widest lens, and produces a 110-degree view ideal for covering large areas. Other options include 8mm, 12mm, 50mm or 100mm for observing a narrow field of view over great distances. Some cameras have varifocal lenses that you can adjust from the recorder or a mobile device to get the perfect viewing angle. 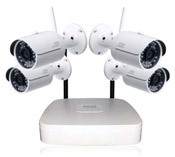 Wireless security cameras are gaining popularity because they do not require a wired connection to the recorder. While these cameras have been limited in terms of clarity, selection, functionality, and reliability, they’re increasingly becoming a great surveillance choice in homes and small offices. The majority of competing cameras are battery-driven. However, we do not carry those types because they have to be recharged, making them less reliable. Our wireless cameras can produce up to 3MP images and transmit a wifi signal up to 75 ft. We guide customers to buy the right security camera system for their needs, and recommend hard-wired systems when distance or structures prohibit an adequate wifi signal. The majority of businesses we work with prefer to store their surveillance footage for approximately 7 to 10 days. Greater storage capacity means you can save your footage for longer, and higher resolution video also takes up more space. Storage hard drives range from 1TB for 2 camera systems up to 64TB for 32 camera systems. Considering that high definition camera videos use considerable digital space, we recommend that customers set their systems to only record when motion is detected within the surveillance area. Most of our security camera systems come with multiple hard drive bays so that you can expand your storage space as needed. We’ll be happy to work with you to choose recorders and storage devices of the right size for your needs as part of a custom-grade solution. Why Choose CCTV Security Pros? With over 60,000 satisfied customers across a wide range of industries, we have experience helping small businesses, government agencies, and Fortune 500 companies alike. We manufacture professional-grade hardware at prices that are cost-effective to purchase and operate. If you found our security camera buying guide helpful, we can’t wait to connect you with our on-staff experts. Contact us to speak with a surveillance professional who can help you select the best security solution for your property.